1. Template is a quick way of recording notes. It reminds you what kinds of questions to ask or information to collect in a clinical scenario. 2. To package information to send or initiate other actions. For examples, some forms contain links that allow you to order the appropriate lab tests or prescribe medication. When you answer questions in the form and press [Finish], the information is written back to the notes. For example, certain fields you have filled in will copy information to the history section of the patient’s notes. The forms are set out intuitively. 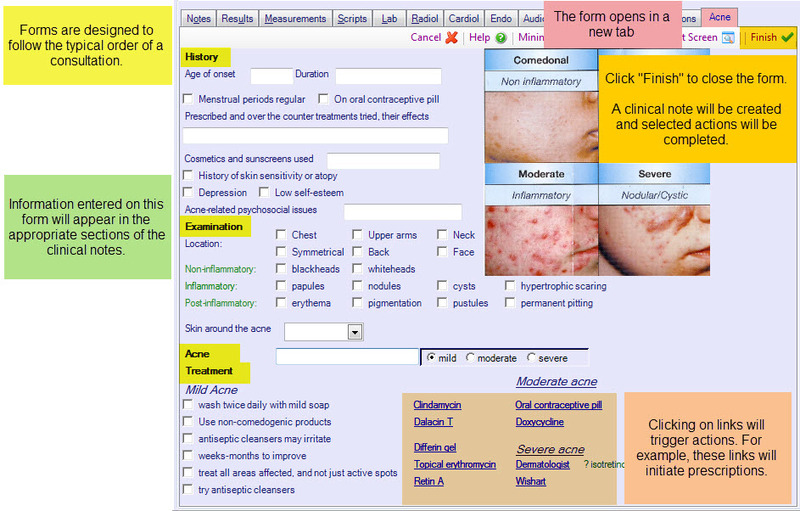 The Acne template is set out so that as you work down the page, you can record history, the results of your exam, some kind of conclusion and lastly, the treatment (or other actions). In a patient’s clinical notes, press [F8] to move to the Forms section. [F9] will move to WebFroms and [F10] to Resources. Go to the bottom section of the screen in a patient’s clinical notes. Click on the Forms tab. There are some forms on the left for quick selection. If you wish to fill in other forms, you can find them in the other sections by scrolling down or filtering results. To filter the forms, click in the light blue space at the top and type in either the start or part of the name. Press [Enter] to move into the list box. If you have narrowed down the list to one form, pressing [Enter] will open the form. Double click on the form you want, and it will open in a new tab. Fill in the details as directed and press finish to save information into the clinical notes or start any actions you have selected.